Welcome to paradise! On this trip to friendly, peaceful Costa Rica, you will see monkeys, showy birds, colorful flowers and many unusual creatures that most people only know from nature specials on TV. On this Nature Discoveries trip, you will gain a unique, first-hand insight into the inner workings of the most fascinating ecosystem on our planet, the tropical rainforest. This carefully planned itinerary will comfortably introduce you to a rich variety of tropical environments in a short time. 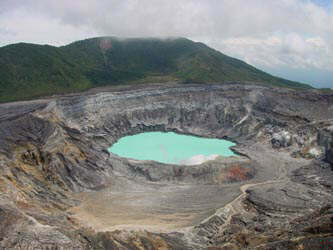 We'll visit many of the national parks and reserves for which Costa Rica is famous. We'll float through lowland lagoons as we watch monkeys in the branches above our heads, and colorful butterflies flitting about; we'll immerse in the sights, sounds, and smells of an active volcano, and enjoy an incredible assortment of colorful hummingbirds feeding on flowers below the deck behind our rooms; we'll walk in the wonderland that is cloud forest, in search of quetzals, bellbirds, and other intriguing creatures; and marvel at the magnificence of the Pacific coast's lush transitional rain forest. Tortuguero National Park is a protected refuge on the Caribbean coast for nesting sea turtles. Here we'll take boat trips through quiet lagoons and backwaters where toucans call from the trees, six species of kingfishers seek fish in the channels, and spider, howler, and white-faced monkeys brachiate above. 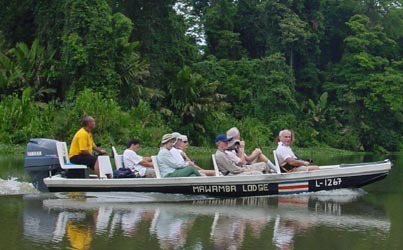 Tortuguero is lowland rainforest at its wildest. We consider our visit to Tortuguero as an Amazon-like experience, except that the birds, monkeys, and other wildlife are much easier to see in Tortuguero! Arenal Volcano, one of the world's most active, is our next stop. 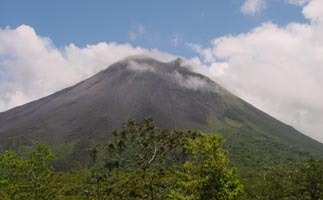 We hope to witness Arenal's spectacular eruptions from the Observatory Lodge, and we'll walk on recent lava flows. The heart-stopping booms, as this volcano safely releases steam, can be a life-long memory. An unexpected surprise at Arenal is the amazing assortment of hummingbirds (one recent group saw 10 species there!) easily viewed as they feed on flowers by our rooms. 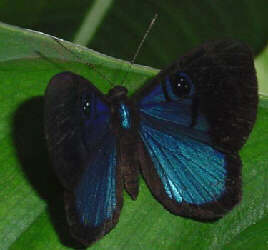 We'll walk in the world-famous Monteverde Cloud Forest, where trees are laden with orchids, bromeliads, and ferns. Birds abound, and every year we enjoy great looks at tropical specialties like quetzals, toucanets, and motmots. We'll sit within feet of six or more species of colorful hummingbirds, that whiz by our ears, visiting feeders and flowers at the Hummingbird Gallery. We'll marvel at the views from the Continental Divide, and see how the trade winds have sculpted an elfin forest. We'll walk in the canopy on suspension bridges (with an alternate option for those who prefer feet firmly on the ground), and you'll have an option to visit a butterfly farm. There's even time to horseback ride, and to see the village of Monteverde, a comfortable Quaker-founded community. We'll culminate our adventure near the Pacific coast, minutes from Carara National Park, surrounded by lush forest, with monkeys, birds, and riveting ambience. We're close to the nightly roost of scarlet macaws, and have an excellent chance to see and hear the raucous calls of these endangered and magnificent birds. Each year we plan this rainforest extravaganza to visit Costa Rica towards the end of the dry season, our favorite time to visit. This is the best time to see a great variety of birds; migrants returning to North America are present, and it is the start of the breeding season for many tropical species. 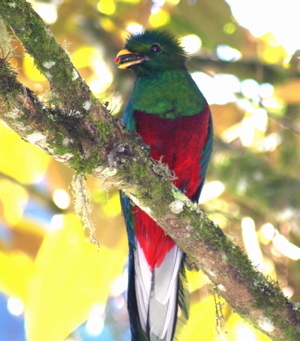 Many of these, like the resplendent quetzal, can be quite noticeable, as they call or display. And we're visiting at the best time of the year to see Arenal Volcano out of the clouds. Your leader is Steven Daniel of Nature Discoveries. We will be joined by an experienced Cost Rican guide as well. Together they will take care of the myriad details to assure a smooth trip. And they'll also point out the subtle interactions and wonders from birds to flowers, lizards to bugs, to deepen your understanding of tropical rainforests.You are sure to learn a lot and have fun along the way! Steven has led this trip yearly since 1988. He brings a special love for this country, and will help you understand the lives of the fascinating birds, plants, and wildlife you'll see. He has done botany research in the Monteverde Cloud Forest, his "home away from home", and enjoys exploring every square meter of this country. Whether birds, insects, unusual tropical fruits, or magnificent rainforest trees, you can be sure you will get a special insight into the complex workings of tropical forests that most visitors miss. Steven has led groups to unique destinations worldwide including the Amazon, Alaska, Utah, Yellowstone, the Galapagos, and Iceland. He has an M.S. from Cornell University, and, in addition to coordinating trips for Nature Discoveries, he teaches natural history courses at Monroe Community College. Our trip to Costa Rica is our longest running trip and always a favorite. We work with hotels, lodges, and other companies that are primarily Costa Rican owned and operated. Thus, much of the income from Nature Discoveries trips is channeled directly into the Costa Rican economy. With the serious plight of rainforests today, it is important that struggling countries like Costa Rica realize direct benefits from ecotourism. This helps to affirm the important notion that saving rainforests can make economic sense. * Photographs by Steven Daniel and are the property of Nature Discoveries, Inc. 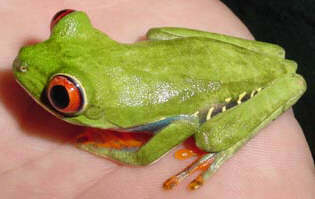 Highlights: "seeing 6 resplendant quetzals, three species of monkeys in the wild, sloths and all those hummingbirds... The interaction with our guides, driver, and most of the Costa Rican people was delightful." "I loved arriving [by boat] at Tortuguero and our night walks there. The Monteverde bridges. The owl in the town square. . . Arenal hotel and pool." "Outstanding variety - from walking in majestic cloud forest to the giant trees at Carara, to the boat trips in Tortuguero." "The birds, the monkeys, the sloths, the butterflies. Did I mention the birds?" "I've always been a solo traveler - wouldn't think of trudging along with a group! I went as a favor to a friend. Well. . . I would not have seen 1/20 of what i saw if I tried to do this on my own. And I actually enjoyed being with the group, especially not having to handle the logistics. And most especially enjoyed and appreciated Steven, [the guide, and driver.] Thanks for changing my mind."